Is 2017 a Bounce Back Year for Cam Newton? Carolina Panther’s quarterback Cam Newton had a disappointing outing in 2016, completing 270 passes out of 510 attempts (52.9%) for 3,509 yards, 19 touchdowns, and 14 interceptions. This was his least accurate season in his 6 year career, including his lowest QB rating (75.8). He also had his worst rushing year for the Panthers, running for 359 yards and 5 touchdowns. 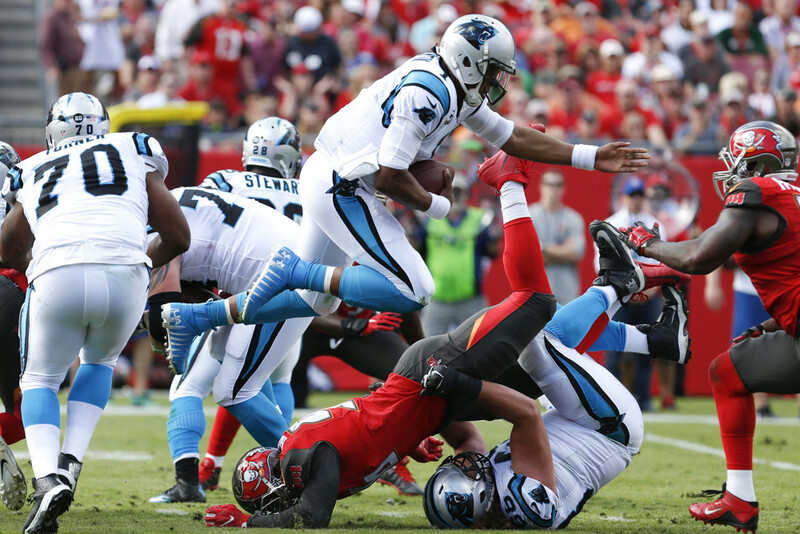 In standard scoring leagues, Newton finished as the 17th ranked quarterback. This performance greatly underachieved his 2016 ADP, where his ADP sat at 3.04, or the 1st quarterback off the board. Those who drafted Newton as their quarterback had high hopes that he would repeat his 34 touchdown, 10 interception season in 2015, where he also ran for 636 yards and 10 touchdowns. However instead of repeating (or even coming close), Newton regressed hard to his mean, which normally wouldn’t have hurt fantasy owners too badly, except for the fact that he also regressed in rushing stats. Newton is currently sitting at an average draft position of 8.09 overall in 12-team standard mock drafts. Newton is the 11th quarterback off the boards. 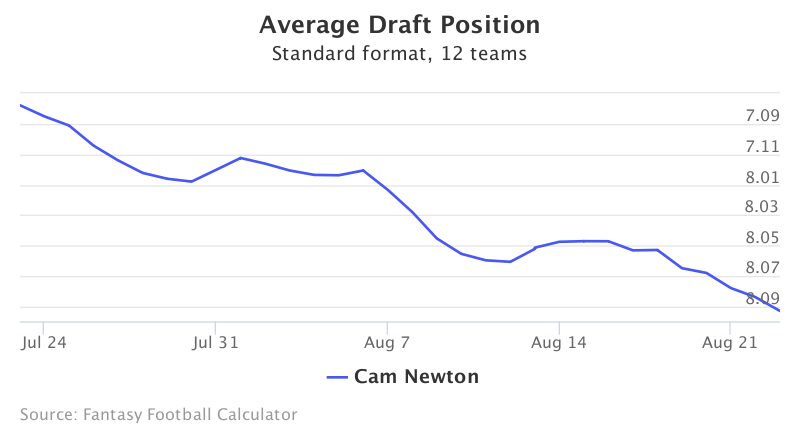 Over the past month, Newton’s stock has fallen in value by a whole round, going from a 7.07 to an 8.09 ADP. With Carolina’s offense looking pretty much the same as last year, and news coming out that coach Ron Rivera wants Newton to run the ball less, fantasy owners are looking to up and coming quarterbacks with exciting offenses. Can Newton Bounce Back to 2015 Numbers? The Carolina offense hasn’t changed much in recent years, with the only huge change coming from the addition of multi-talented running back Christian McCaffrey. McCaffrey is known for his receiving talents, so Newton may look to him in situations when no one is open or he is being pursued. McCaffrey also allows another player for opposing defenses to watch, which could allow Newton to scamper for a decent run. However no one really knows how McCaffrey will be used as of yet. Wide receiver Kelvin Benjamin has been a frustrating fantasy player to own, never fully living up to his NFL 1st round draft choice in 2014. After missing 2015 with a torn ACL, Benjamin has looked uninspired, coming into camp heavy and out of shape. However, Benjamin has looked decent in his first 2017 preseason games, and if he can put in the work, he has the potential to be a WR1. Cam Newton would benefit greatly if this 6’5” wide receiver can pull it together. These two players may in fact be the determining factors in whether or not Newton returns to 2015 form, or falls into the pit of mediocrity. Cam also has a decent health record, missing only 3 games throughout his career. It should be noted though that Cam has some concussion concerns, that could be the reason why coach Rivera wants him to run less. Cam Newton is currently being drafted at 8.09 in 12-team standard mock drafts, good for a low end QB1, which is crazy considering he was the 1st quarterback off the board just one year prior. Newton finished last year as the 17th ranked quarterback, disappointing fantasy owners everywhere. Even with the addition of McCaffrey and hopeful emergence of Benjamin, it is still difficult to say whether or not Newton will bounce back. It will be harder if he is forced to run less, but hopefully Newton can put his talents completely into his passing game to make up for it.